Investment management within the insurance industry is rapidly changing and becoming more complex and diverse than ever. Traditional asset classes not delivering the expected returns demands new insights and knowledge around new asset classes. In addition, the burden of regulatory compliance and the costs associated with it remains a challenge. Like most insurance companies, you probably see cost management as a crucial role in ensuring continued profitability. We support you with a range of innovative capabilities that, among other things, reduces personnel requirements, eliminates manual processes and minimizes exception processing..
Credence iDEAL Funds is a multi-asset class, multi-entity and multi-currency funds management solution designed to automate the complete investment management operations of life and general insurance companies. 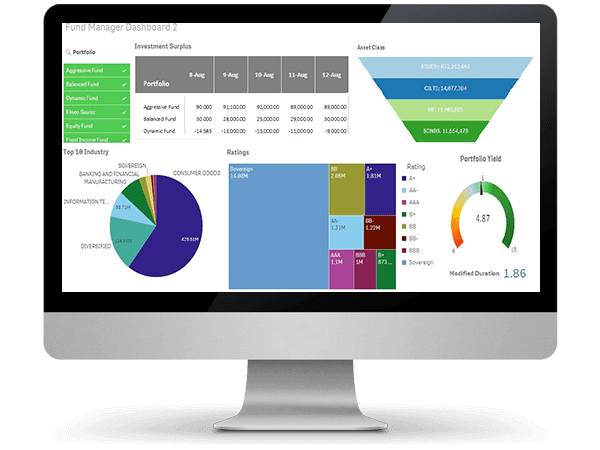 iDEAL Funds is a holistic solution offering end to end investment management and transaction processing system right from interfacing with the Policy Administration system for Fundwise subscriptions/ redemptions to pre-deal analytics, order management, deal capture, position management, valuation, bank account management, reconciliation, accounting to in house NAV generation and management fees and expenses calculation. The solution also has a powerful risk management module for maintaining limits and exposures tracking to meet regulatory and internal policy requirements. The solution can also be scaled to prepare reporting suites required to meet internationally accepted standards of reporting or to meet compliance requirements of local regulatory bodies (IRDA, GIPS compliance reports etc).